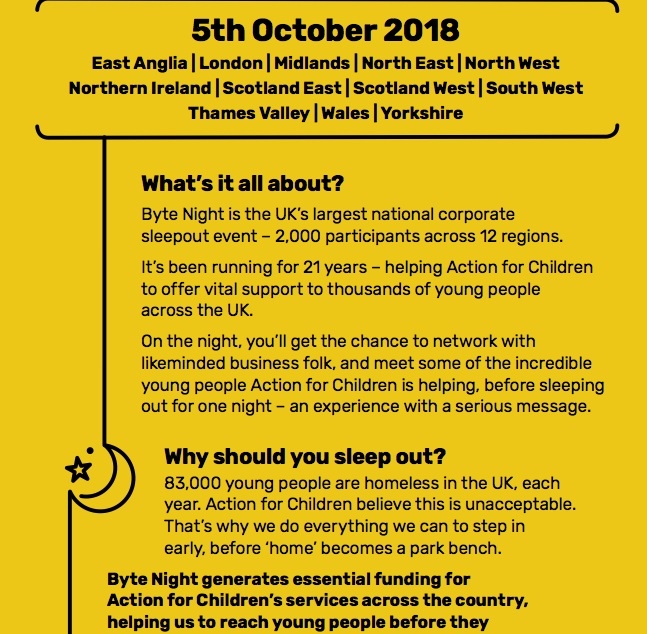 The background: Action for Children’s flagship annual fundraising event is a sleepout, called Byte Night – taking place across 12 regions in the UK. It’s been running for over 20 years, and involves people from different businesses sleeping outside, in teams, for one night – raising funds for Action for Children in the process. Last year’s event raised £1.2m for the charity. The aim was to beat that total by some distance this year – in part, by changing the messaging. 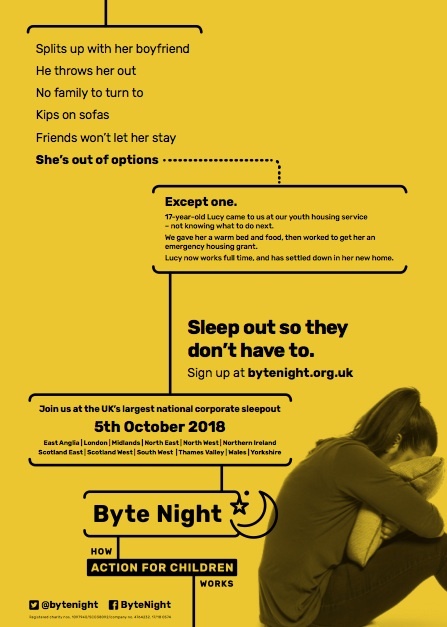 The issue: Byte Night had been positioned as an event aimed at bringing an end to youth homelessness – hence the sleepout element. The problem is, Action for Children is not a homeless / youth homeless charity. They don’t offer an outreach service to young people who are already on the streets, and – with the messaging as it stood – they were falling straight into Centrepoint and EYH territory. They were also directly competing with much larger sleepouts, such as Sleep In The Park, in Scotland. 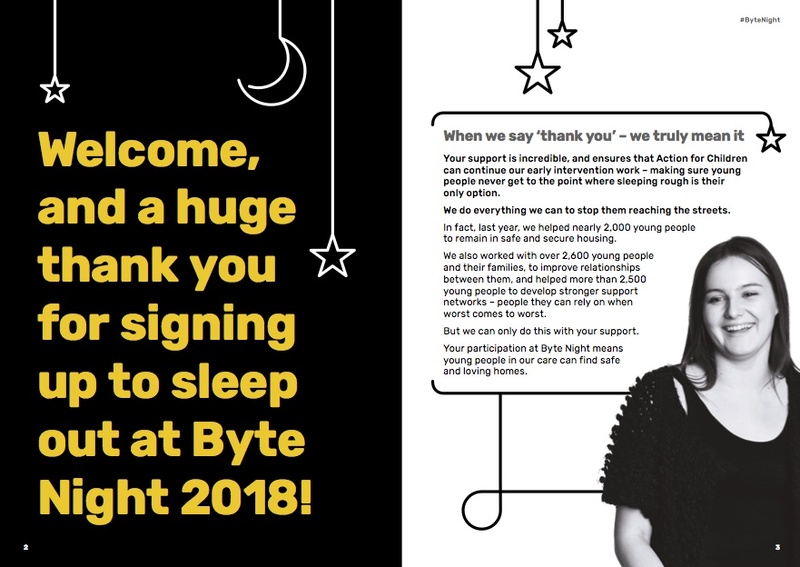 The event needed to retain the sleepout element, but the message had to brought closer to what Action for Children actually do, as a charity, in helping young people. 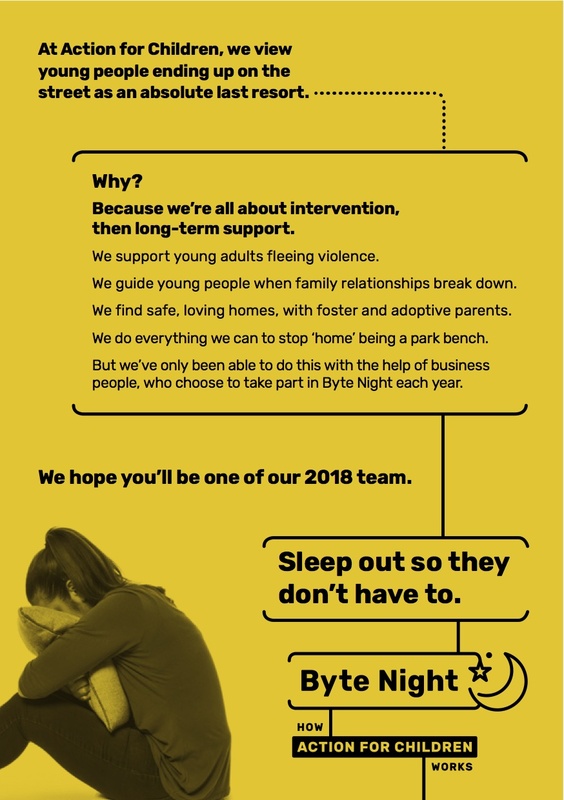 The solution: Bring Byte Night back to what Action for Children do, in a tangible sense – all the early prevention work, to make sure that young people never end up on the street. Get across that Action for Children reach young people before they become homeless. This involved reworking stories for posters and pull-up banners, and rewriting all copy for flyers and welcome packs (as well as website banners, sponsor packs, sponsor forms etc) – highlighting where/how Action for Children step in: finding loving foster/adoptive homes, helping young adults fleeing violence, providing night stop services (short-term accommodation), mediating when family relationships break down. In turn, this allowed the Story Team to source a number of different, powerful stories/case studies, beyond those that directly involved homelessness. 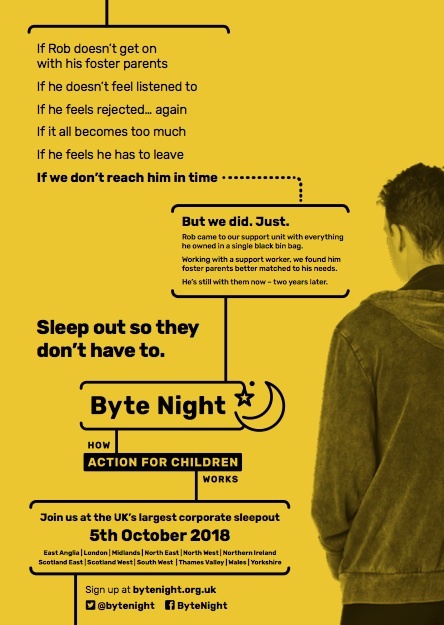 The new messaging was embodied in the strapline ‘Sleep out so they don’t have to’ – emphasising the preventative nature of Action for Children’s work.